There are a few things one must pack in the car before heading out on a photo adventure in the Upper Valley on the border of New Hampshire and Vermont along the Connecticut River Valley in the days following a winter snow storm. Obviously, cameras, lens, extra batteries, tripod and such but beyond the photography equipment one must consider the possibility of being stuck in some remote corner of New England. So before setting out I checked the gas (quarter tank, hmmm that will be cutting it close), tossed a bag of water softener salt in the back of the four wheel drive Subaru Forester, threw in some snacks and a water bottle and some traction pads. And last but not least some money for buying maple syrup should the need arise. There are not a lot of places to pull over on the country roads in this area so it pays to be prepared. My purchase for the weekend to use up some of that maple syrup! I didn’t have a lot of shots planned out other then snapping some shots of the ice fishing shanties on the frozen lakes. These little temporary winter towns that dot the frozen lakes in the region are always intriguing. Other then that I went to explore. Eventually I found my way to the Mt. 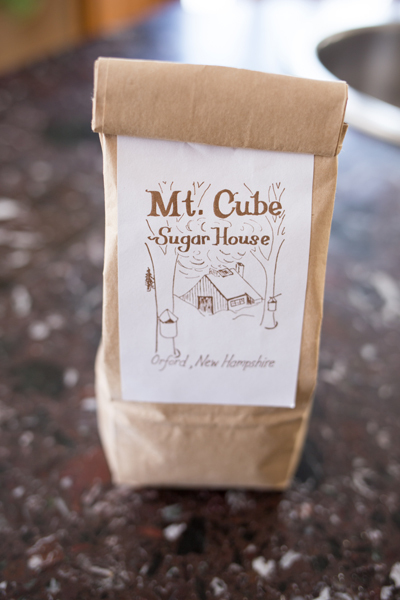 Cube Maple Sugar Farm in Orford, New Hampshire. I pulled in to the little gift shop that was open with the “honor system” and I picked out some pancake mix. My wife would kill me if I brought back any more maple syrup. 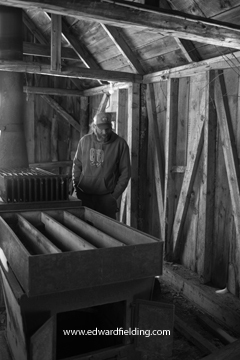 We still have tons left from last year when I started my series of photos of the traditional maple sugar operations that keep the local farmers busy in the late winter. For those city slicker who don’t understand the concept of the honor system in a store, here in the country products are often sold in farm stands and roadside stores with just signs and a cash box. If you need change you make it right there. It works out for the most part. Every once in a while some jerk rips off the cash box but its rare. While I was sticking a fiver into the box, the caretaker stopped by to see if I needed any help. Seeing I was interested in the operation Jimmy offered to show me around. The season hasn’t started yet but the new equipment in the main sugar house was impressive. Probably the largest evaporator systems I’ve seen thus far in my exploration of the industry. Jimmy who lives on the property in a trailer next to the sugar house gave a bit of history about the farm on the slopes of Mt. Cube. At one time one of the governors of New Hampshire owned the property and they have over 1,000 acres. The sap is collected by a vacuum system from plastic piping tapped into individual trees and then into larger collection pipes that actually run under ground. The watery sap is then collected in an old tanker truck. From there its brought into a very modern reverse osmosis filtering system to draw off excess water before going on to the huge oil fired evaporator where more water is steamed out of the sap and it is boiled down to sugary sweet syrup. A very impressive operation indeed. Open house is a few weeks away when the sugar houses throw open their doors to the public. But like any proud craftsman, Jimmy said he is happy to show off the operation anytime. He also gave me a look at the old sugar house from the days of metal buckets and wood fired evaporators. While the present day Mt, Cube Farm has a state of the art system for tapping, collecting and processing maple tree sap into sweet sugary syrup the old shack is basically for the tourists. This old sugar shack was pulled out of the woods and installed in front of the store as a showcase for how things used to be done with wood fired evaporators. My photographs of the New England traditional maple sugar operations is art of an ongoing series on maple syrup production in New England by fine art photographer Edward M. Fielding. Four images from this series will be show at the March photography show at the Gallery W at the Whitney museum in Pittsfield, MA. Images from this series are also available for purchase from my Fine Art America Gallery.